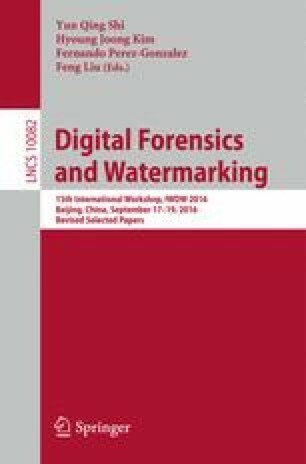 In this paper, we propose a robust lossless database watermarking scheme the detection of which is optimized for the traceability of databases merged into, for example, shared data warehouses. We basically aim at identifying a database merged with different other watermarked databases. Based on the modulation of attribute circular histogram’s center of mass, we theoretically prove that the impact of the database mixture on the embedded identifier is equivalent to the addition of a Gaussian noise, the parameters of which can be estimated. From these theoretical results, an optimized watermark detector is proposed. This one offers higher discriminative performance than the classic correlation-based detector. Depending on the modulated attribute, it allows us to detect a database representing at least \(4\%\) of the databases mixture with a detection rate close to \(100\%\). These results have been experimentally verified within the framework of a set of medical databases containing inpatient hospital stay records. The authors are very grateful to the Department of Medical Information and Archives, CHU Lille; UDSL EA 2694; Univ. Lille Nord de France; F-59000 Lille, France, for the experimental data used in this study.